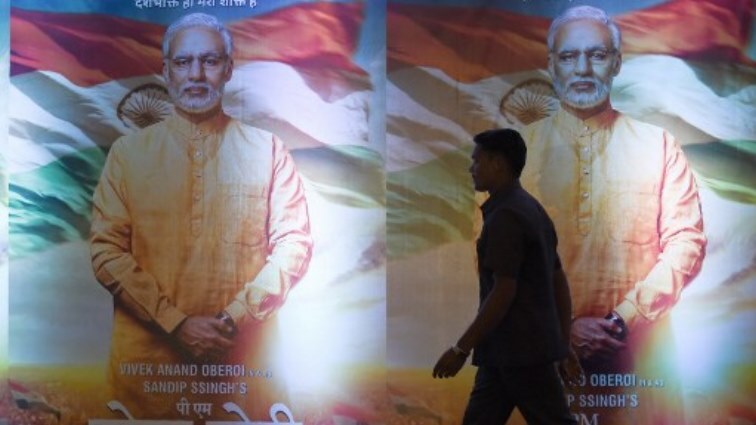 India banned Wednesday the release of a biopic about Prime Minister Narendra Modi during the country’s marathon elections after complaints that the flattering portrayal would give the ruling party an unfair advantage. Modi’s right wing Bharatiya Janata Party (BJP) is seeking a second term, defending a landslide win over the opposition Congress party in 2014. The result is predicted to be close however. In a win for the opposition, India’s Election Commission barred the cinematic release of the film until voting concludes on May 19. Under Indian election rules, the publication of any content deemed as campaign material — including advertisements, films and even social media — requires the election commission’s prior approval. The commission — which organises the world’s biggest democratic poll with 900 million eligible voters choosing 543 MPs — said the film “has the potential to disturb the level playing field during the elections”. Congress insisted it was propaganda and resisted the timing of its release, even taking its fight to the country’s highest court. The movie tells the story of the Hindu nationalist leader’s ascent to power from his days selling tea at a train station. The film had been granted a censors’ certificate and was planned to release Thursday as the first wave of voters went to the ballot box. The producers of two TV series were also given warning notices by the Election Commission for promoting Modi’s pet schemes through their shows, The Press Trust of India reported. Seats in 20 states will be decided on Thursday — the first of seven days of voting spread over six weeks. Security was bolstered in troubled Chhattisgarh state, which goes to the polls Thursday after a deadly ambush on an election convoy left five people dead. Some 80,000 troops, police and paramilitaries will be deployed to the central state where Maoist rebel groups detonated a bomb and fired on the convoy, state police chief D.M Awasthi said. The election commission insisted the attack that left a state lawmaker campaigning for Modi and his bodyguards dead would not change its schedule. Gunmen burst into a Jammu hospital and shot dead the regional leader of the right wing Rashtriya Swayamsevak Sangh, which is closely linked to Modi’s party. Modi has used India’s action against Pakistan to bolster his strongman image and divert attention from criticism over a lack of jobs across the country and a farmers’ debt crisis. Rahul Gandhi, the Congress leader challenging Modi, filed his nomination papers Wednesday following a roadshow in his home constituency of Amethi in Uttar Pradesh state. Various opinion polls have indicated an alliance led by Modi’s BJP will win up to 273 of the 543 parliament seats at stake, just one more than required for a majority. The post India bans Modi film until after mega-election appeared first on SABC News – Breaking news, special reports, world, business, sport coverage of all South African current events. Africa's news leader..